Well, we enjoyed just our second winning week, posting a solid 6-4 mark. We'll need more like that to have any hope of finishing with an even record. The overall mark is now 41-48-1. Home teams in bold. 2013 has been a disappointing season for both these squads. In fact, the loser of this game is likely to miss out on a bowl appearance for the first time in a while (even the winner must tread lightly over the season's final month). TCU has not missed a bowl game since 2004, and West Virginia has appeared in every postseason since 2001. West Virginia has continued their putrid play on defense, but unlike years past, they do not have the offense to bail them out. The trio of quarterbacks used by the Mountaineers have thrown just nine touchdown passes on the season. Last year, Geno Smith threw 42. Still, I like the Mountaineers catching nearly two touchdowns against a TCU team that, while strong on defense, has issues of their own moving the football. West Virginia is probably a little under-valued, as they have not gotten a shot at the weak underbelly of the Big 12 (Kansas and Iowa State), while TCU has already had a chance to pad their statistical profile against Kansas. Look for West Virginia to keep this one within shouting distance in Fort Worth. Connor Shaw came off the bench and saved the Gamecocks bacon against Missouri last week. Down 17-0, Shaw brought the Gamecocks back and forced OT where they won thanks to a missed field goal. Now the Gamecocks return home where they are double-digit favorites over a solid Mississippi State team. The Gamecocks are just 1-2 Against the Spread (ATS) as double-digit home favorites this season, allowing both Vanderbilt and Kentucky to stay close at Williams Brice. The Gamecocks are probably a little over-valued after their win last week, while Mississippi State is a shade under-valued after their own home escape over Kentucky. I don't think the Bulldogs can do enough to win here, but they should keep it within two touchdowns. The Temple Owls are in the throws of another losing season, but they may have found themselves a quarterback. Freshman PJ Walker has played the majority of snaps in the past four games and the Owls have scored 7, 20, 33, and 49 points in those games. Collectively, the team has averaged 6.50 yards per play in those four games after averaging just 4.78 yards per play in their first four. Of course, they are just 1-3 in the last four games because their defense is atrocious. The only Big East team even close to them in defensive ineptitude is...Rutgers. When they aren't playing IAA schools or Eastern Michigan, the Knights have allowed over 40 points per game! The Owls have not beaten Rutgers since 2002, and they may not be able to win in New Jersey, but they should stay within two touchdowns. The Warriors from Hawaii may be 0-7, but they are not your typical laughably bad winless team. Three of their losses have come by a touchdown or less and all seven of their losses have come to potential bowl teams (all seven teams won't make the postseason, but they should all win at least five games). Statistically, Hawaii rates out as a just a shade below average in the Mountain West. The Utah State Aggies are far from the powerful outfit they were when Chuckie Keeton was under center. Darell Garretson lacks the running ability Keeton displayed and the Aggies are much less explosive with him directing the offense. Utah State should win this game rather easily, but three touchdowns is too much to lay against a decent team like Hawaii. The Bobcats from Texas State moved one step closer to bowl eligibility (in just their second season of IA football) with their home win over South Alabama. Now they take their show on the road against an Idaho team that has been sneaky tough at the Kibbie Dome. The Vandals have only played three homes games this season, but they have covered in two of them, including against Northern Illinois and an outright upset of Temple. Texas State does not have the offensive firepower to roll over Idaho away from San Marcos. Look for the Vandals to keep this one tight. Time to jump on that North Texas bandwagon, a locomotive that could very well be on course for the Conference USA Championship Game. Let's give head coach Dan McCarney his due. In the six seasons preceding his arrival, North Texas won 13 games. In two and a half seasons at the helm, McCarney has won 14. His charges are riding a three-game winning streak and are unbeaten under his watch as a home favorite (5-0 ATS as well). Rice is a quality team also in contention for the Conference USA flag, but with this spread under a touchdown, North Texas is the play here. I'll say this for Todd Graham, during his brief tenure in the desert, his teams handle their business against lesser opponents. Last season, the Sun Devils faced six IA opponents that would not qualify for bowl games. The Sun Devils went 5-1, won by an average of 23 points per game, and covered in the five games they were favored. In 2013, the Sun Devils have faced just one team unlikely to qualify for a bowl game. They trounced Colorado by 41 points as four touchdown favorites. This game is on the road, but an upset over Southern Cal notwithstanding, the Cougars have been only marginally better than they were last season. With the division title very much in play, the Sun Devils should roll here. The North Carolina Tar Heels are likely the best 2-5 team in the country, and with a light closing slate, could end the year on a six or seven game winning streak (including a potential bowl game). The Tar Heels have lost at South Carolina, at Georgia Tech, at Virginia Tech, and home against Miami. Of those four, only the South Carolina game was non-competitive. Of course, they also lost at home to East Carolina in a game where they allowed 55 points, the most the Pirates have scored against a major conference team since they dropped 61 on Virginia in 1975. Meanwhile, NC State has one more win than the Heels, but their trio of victories have come against bad teams (Louisiana Tech and Central Michigan) or teams from IAA (Richmond). North Carolina has not beaten NC State in Raleigh since 2005. However, this could be the worst team NC State has fielded in that span. With the small spread, the Tar Heels are a solid play here. This appears to be your classic case of an extreme overreaction. Yes the Hokies lost at home to Duke last week, granting the Blue Devils their first road win over a ranked team since the dawn of time, but the Hokies were still quite impressive defensively. They limited Duke to just 198 yards of total offense and allowed less than four yards per play for the fifth time in eight games. This line should be about a touchdown, but the public has turned their collective backs on Virginia Tech. Take advantage and buy low on the Hokies this week. Under Mark Dantonio, the Spartans have beaten the Wolverines four of six times and covered each time as a betting favorite. The Spartans are also 4-0 in Big 10 play, so a win here would basically eliminate Michigan from title contention. The Michigan State offense has improved dramatically since their abysmal early showing, and the defense is as nasty as ever. Look for Michigan State to win this one by at least a touchdown. 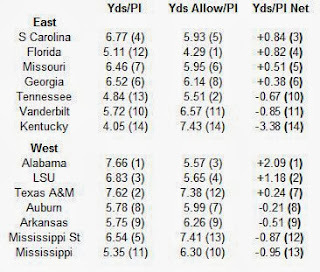 Two weeks ago I began a midseason look at three conference races in the MAC, Pac-12, and SEC using yards per play. This week, we tackle four more conferences, including the ACC, Big 10, Big 12, and Conference USA. Is Florida State back? After numerous false alarms and premature attestations, it appears the Seminoles are legitimate national contenders. For the first time since 2000, the ACC could place a team in the national championship game. 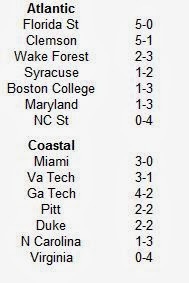 ACC teams are 6-6 in games against teams from BCS conferences. However, league members have also lost five games to teams from outside BCS conferences. Boston College--The first season of the Steve Addazio has featured minor improvement. A bowl game is still in play for the Eagles, but the (relative) glory days of the mid-2000s are long gone. Clemson--The Tigers proved they were not quite ready for primetime, but a third straight double-digit win season is well within reach. The Tigers have not accomplished that feat since they won ten games in each season from 1987 through 1990. Duke--The Blue Devils are far from contenders in the Coastal, but bowl eligibility in consecutive seasons is quite a feat. You can probably guess the last coach to lead Duke to consecutive bowl eligible season. Georgia Tech--The Yellow Jackets have already played six conference games! With losses to Miami and Virginia Tech, they are probably out of the division race, but they have now finished with at least a .500 conference record for the 19th consecutive season. Florida State--The Seminoles have been ridiculously dominant thus far. They have won each of their games by at least 14 points and have a Hesiman contender for the first time since Chris Weinke was under center. Maryland--That 4-0 start seems like ages ago. Still, in their ACC swan song, the Terps should manage to eke out abowl bid. Miami--Is this really a top-10 team? Probably not, but the ACC stands as the lone conference with multiple undefeated teams. North Carolina--Perhaps this is damning with faint praise, but the Tar Heels are the best 2-5 team in the country. The back-half of the schedule is very manageable. Expect some bowl or offseason stories about how the team 'bought in' and 'never stopped believing' after their rough start. NC State--If the Pack somehow make it a bowl, they can thank whoever developed their non-conference schedule (home games against Louisiana Tech, Richmond, Central Michigan, and East Carolina). Pittsburgh--As far as debuts go, this one has been pretty nondescript. When does basketball season tip off? Syracuse--In their last three losses, the Orange have allowed 48, 49, and 56 points. Virginia--The vultures are circling Mike London. When we look back on this season many years from now, everyone will wonder how the heck they beat BYU. Virginia Tech--The Hokies are currently wasting a phenomenal defensive performance. In their home loss to Duke, the Hokies held Duke quarterback Anthony Boone to just seven completions and picked him off four times. Unfortunately, Logan Thomas threw four picks of his own. Wake Forest--The Deacons have rebounded nicely after a rough start. The loss to Louisiana-Monroe may end up costing them a bowl bid. 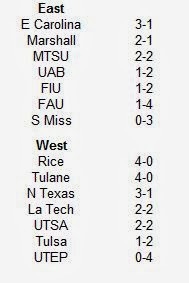 Here are the Conference USA standings. The new (and improved?) Conference USA has an exciting race in store for fans. The three teams in contention out west have not won a conference title between them since 2004, and finished a combined 13-24 overall last season. Outside the league, Conference USA has gone a collective 4-23 against teams from BCS conferences, with the wins typically coming against the dregs (Kansas, Memphis, South Florida, and North Carolina) of the big leagues. League members lost just once, albeit in blowout fashion, to teams from IAA. East Carolina--Can they lay claim to being the best team in North Carolina? They already beat the Heels in Chapel Hill and get their shot at the Pack in Raleigh in November. 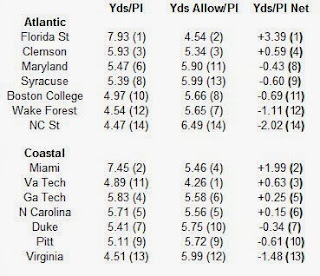 Florida Atlantic--Carl Pelini has not been under quite as much scrutiny as his brother. Three of their four league losses have come by a touchdown or less. Better than their record. Winning out and finishing 6-6 is not out of the questions. Florida International--Just two years ago, this team beat Louisville on the road. This season, they instituted a running clock when they played the Cardinals. Maybe firing Mario Cristobal was a bad idea. Louisiana Tech--The Bulldogs have won two of three. For Skip Holtz, that represents progress. North Texas--The Mean Green have three consecutive home games upcoming. They are 10-4 at home under head coach Dan McCarney. I wouldn't pencil them into the Conference USA Championship Game just yet, but I think they are the favorite to get there from the West. Marshall--The division title will probably come down to their game in Huntington against East Carolina on Black Friday. Middle Tennessee State--Their closing schedule features three of the worst teams in the league (FIU, Southern Miss, and UTEP). They should get back to a bowl after being left out in the cold last season. Rice--The Owls are desperately seeking their first conference title since 1957. As it is, they are bowl eligible for consecutive season. Not too shabby. Southern Miss--The losing streak now sits at 19 in a row. The conference losing streak is 'only' eleven straight. Texas-San Antonio--The Roadrunners have been sneaky good in just their second season of IA play. They need to win out to guarantee a bowl bid, and that is probably untenable. Tulane--The Green Wave are somehow 4-0 in the conference despite middling numbers. Their league wins have come by nine, three, three, and seven points. Still, congrats to the Green Wave on being bowl eligible. Under head coach Curtis Johnson, the Green Wave are a spectacular 7-0 Against the Spread (ATS) versus conference foes at home. Tulsa--The Golden Hurrican were 14-2 in conference play in Bill Blankenship's first two seasons at the helm. A bowl game is still in play, and Tulsa has played well (at least in the conference), but remains a dicey proposition at best. UAB--All offense, no defense thus far. Their next three games are against contenders from the east (Middle Tennessee, Marshall, and East Carolina). Can they play the role of spoiler? UTEP--Its saying a lot when these guys may be the worst team in the league. Better get ready for their ritualistic slaughter against Johnny Football this weekend. Here are the Big 10 standings. Big 10: How good is Ohio State? That is the $64,000 Question. Ohio State squeaked by a good Wisconsin team at home and a mediocre Northwestern team on the road. They also let a mediocre Iowa team hang with them in Columbus. And then they bludgeoned Penn State on Saturday night. There are no real tests on their schedule until they travel to Michigan in the regular season finale and (an assumed) trip to the Big 10 Championship Game. The Big 10 has gone 9-8 against other BCS conference teams. However, the only real quality win is Michigan over Notre Dame (and maybe Illinois over Cincinnati). 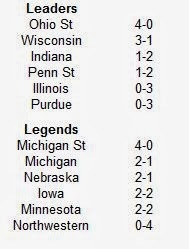 Big 10 teams lost three games to teams from outside BCS conferences, with two of the losses coming to Northern Illinois. Illinois--The conference losing streak now stands at 17. Is another 0-8 campaign in the cards? Indiana--The offense is good enough to get the Hoosiers to a bowl, but the defense may keep them home yet again. Iowa--The Hawkeyes are a decent team, and for the time being will serve as the feather in the cap Northern Illinois gallivants about in. Michigan--This Saturday's game against the Spartans is practically a must-win if the Wolverines have designs on playing in the Big 10 Championship Game. Michigan State--The Spartans have played Purdue and Illinois in the early part of their schedule. That would be my only qualm with citing them as the Legends Division favorite. Minnesota--Bowl eligible for a second consecutive season. Bravo. Can they win more than two league games for the first time since 2009? Nebraska--Two of their three conference games have come against Purdue and Illinois. Curb your enthusiasm regarding their numbers accordingly. Northwestern--The Wildcats are better than their 0-4 record would otherwise indicate. Can they make Bo Pelini's seat a little warmer this week? Ohio State--Purdue, Illinois, and Indiana are their next three games. They will probably look like worldbeaters when they roll into Ann Arbor. Penn State--Look at those offensive numbers. Thank goodness for Purdue right? Purdue--Mark your calendar for November 23rd. The Boilermakers take on the Illini with last place in the Leaders Division on the line. Wisconsin--Can the Badgers sneak into a BCS bowl? They could run the November table to get into the conversation. The Baylor Bears are currently unbeaten and averaging an absurd 64 points per game. Their quarterback is averaging nearly 14 yards per pass! Obviously, the Bears won't end the season with those gaudy numbers, but wow! With the Bears leading the conference, the league could see a different champion for the sixth consecutive year. The Big 12 has gone 4-4 versus other BCS conferences. This number probably deserves an asterisk as two of those wins have come against SMU. 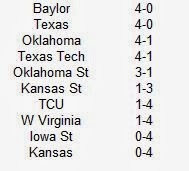 Big 12 teams have also lost four times to teams from outside BCS conferences, including a pair of losses to IAA teams. Baylor--The Bears are just a shade behind Oklahoma State for the top defense in the conference as well. Keep in mind Baylor's schedule is insanely back-loaded. 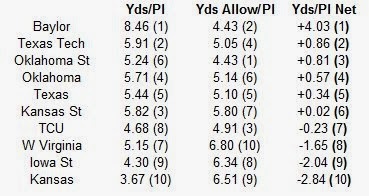 The Bears have played teams currently ranked 6th, 8th, 9th, and 10th in the yards per play metric. Iowa State--Not a lot has gone right for the Cyclones in 2013. The good news is that Kansas is still on the schedule. Kansas--How's that decided schematic advantage working? Kansas State--Even without Collin Klein, the Wildcats offense has remained stout. Oklahoma--The Sooners have not been their usual dominant selves, but they remain players in the conference race. Oklahoma State--Could you have envisioned the time when an Oklahoma State team would be powered by their defense? Texas--So much for the Mack Brown funeral procession eh? Oklahoma State, Texas Tech, and Baylor close the Longhorns schedule, so the league title is still a longshot. Texas Tech--Like Baylor, their schedule is back-loaded. The game this weekend with Oklahoma State is an eliminator for all intents and purposes. TCU--Their second year of life in the Big 12 has been even worse than the first. The Horned Frogs could miss out on a bowl for the first time since 2004. West Virginia--Against teams not name William and Mary or Georgia State, the Mountaineers have been outscored by 101 points. Since starting the 2012 season 5-0, West Virginia has gone just 5-11. The wheels have not yet come off the wagon, but they have loosened quite a bit. Another losing week (this time 4-6) pushes the yearly mark down to 35-44-1. Unbeknownst to me, when picking this weeks teams, I leaned heavily toward the road team. Fully nine of the ten picks are teams playing away from home. As always, proceed with caution. Home teams in bold. After a disappointing 5-7 season, the Houston Cougars have already matched their win total from 2012 and nearly eclipsed it before falling by a single point to BYU. Despite the loss, the Cougars still control their own destiny (as much as destiny can be controlled) in the American Athletic Conference race. The Cougars travel to New Jersey this week and attempt to eliminate Rutgers from the conference race. The Scarlet Knights already have one conference defeat and a second will relegate them to a fledgling bowl in late December. Houston may have a loss, but Against the Spread (ATS) they are unbeaten in 2012. Led by freshman quarterback John O'Korn, the Cougars have a great chance at beating the Scarlet Knights in their first ever meeting. The Panthers first season of IA football has been as one would expect. The Panthers are 0-7 overall, with three of the losses coming to IAA teams. 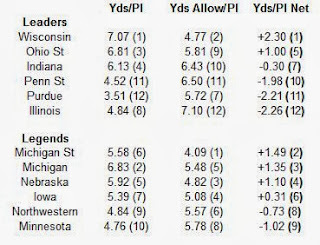 However, against IA opponents, the Panthers have covered the spread each time. Of course, one of those spreads was more than 50 points against the Crimson Tide. Still, after that beating at the hands of Alabama, Georgia State has dropped their first two Sun Belt games by just a touchdown apiece. Now the Panthers look to win their first game as a IA program against a Louisiana-Monroe team that has scuffled on offense. After averaging nearly 34 points per game en route to their first ever bowl trip last season, the Warhawks are averaging just north of 17 per game this season. They beat Texas State 21-14 in their last game, but 14 of the points came via interception returns. The Warhawks may get the win here, but their offense is not prolific enough to trust them laying double-digits. For all intents and purposes, a win by Missouri on Saturday night will lock up the SEC East for the Tigers. The Tigers would have zero league losses and own the tiebreaker over their three closest competitors in the division. Hope appears lost for the Gamecocks with quarterback Connor Shaw unlikely to play. However, Dylan Thompson has been a more than capable backup in the past. Missouri is probably a little overvalued after their stomping of Florida last week, and the Gamecocks are a little undervalued, as they beat Tennessee everywhere save the scoreboard last week in a 23-21 loss. The betting public has doubted Missouri all year, but now they appear to have done a 180 and put too much faith in them. I think the Gamecocks tighten the east race with a road win on Saturday night. Fresno State has a shot at a BCS bowl bid thanks to their 6-0 record and initial ranking of 17th in the BCS standings. Still, their best wins have both come at home by a single point (over Rutgers and Boise State). Fresno State has played just two road games thus far, and San Diego State represents the strongest road team they will play until the regular season finale against San Jose State. The Aztecs have rebounded from a rough start by winning three in a row, and with a win here, could actually take control of the division race (its the West division in case you were wondering). The Aztecs are better than people give them credit for, and Fresno is probably a shade worse than people think. Look for Fresno to prevail, albeit in a high-scoring, close affair. If you had come into the 2013 season with the idea that you would bet against Texas A&M anytime they were a favorite, you would have cleaned up on the parlay card. The Aggies have covered just once in five games as a favorite this season (against a IA team). Their defense continues to be atrocious, giving up over seven yards per play to conference foes. I don't think Vanderbilt can win in College Station, but even if the game is not close, the porous Aggie defense will leave the backdoor wide open for a cover by the Commodores. The nation at-large is still sleeping on Ball State and their coach Pete Lembo. The Cardinals have already won handily at Virginia and are 7-1 with a real shot at their first MAC title since 1996. Don't fret the double-digit spread, as the Cardinals have already covered twice this season as a large road favorite. Plus, while Akron has shown some fight under Terry Bowden, they are just 1-5 ATS as a home under dog. Look for Ball State to cruise here. 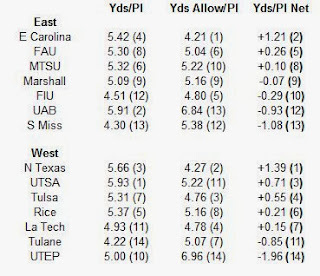 The West division in Conference USA is a little upside down at the moment. Tulsa, a team that won 19 games in 2011 and 2012, is just 2-4 halfway home in 2013. However, with just one conference loss, they are still in the race for a second consecutive league title. Meanwhile, Tulane is the early leader in the division with a 3-0 record and five wins overall for the first time in a decade. However, while the Green Wave have been winning, they have been doing it with smoke and mirrors. The Green Wave were outgained by nearly 400 yards in their past two games against North Texas and East Carolina, but won thanks to three non-offensive touchdowns, some clutch kicking (made six of eight field goals), and some not so clutch kicking by their opponents (made four of eight field goals). Tulsa appears to be the better team, and if they can avoid falling on their own swords, they should win by at least a touchdown here. The losing streak for the Golden Eagles now stands at 18 games. To put that number in perspective, Southern Miss lost 19 games in Larry Fedora's four seasons as head coach. The Eagles don't differentiate in who they lose to either. They have lost to teams from big conferences (Arkansas, Louisville, and Nebraska), teams from the Sun Belt (Western Kentucky and Texas State), mid-major powerhouses (Boise State), and of course, teams from their own conference (the streak in league play stands at a more respectable ten games). Southern Miss has one of the worst offenses in the land, averaging just a shade over 12 points per game on the season, and should be blown out by one of the best teams in Conference USA. If this was 2012, when Kent State enjoyed their dream season, Kent State might be a solid play here. However, the Golden Flashes have not played as well in their encore performance. They have beaten just two teams, Liberty (IAA) and Western Michigan, that have won exactly zero games against IA opponents. They host a Buffalo team that has won five in a row after a rough start that included games at Ohio State and Baylor. 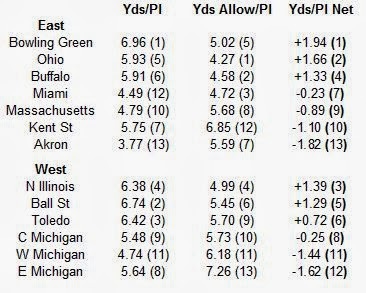 Buffalo currently boasts the best defense in the MAC, and should be favored by at least a field goal in this game. I'll say this for the Jaguars of South Alabama, they have played exciting games in 2013. Five of their six games have been decided by seven points or less, with two being decided by a single point, and one by just two points. After winning just twice in their inaugural IA season (and just once against a IA team), the Jaguars have three wins and could threaten bowl eligibility. Similarly, Texas State has enjoyed moderate success in their second season of IA football, winning four times in seven games after going just 4-8 in 2012. In the early going, South Alabama has the best offense in the Sun Belt and should be able to make hay against Texas State in San Marcos. Another blah week, thanks mostly to Michigan, who refused the best offers Penn State made to take the game. Still, 5-5 is better than 3-7. The yearly mark now stands at 31-38-1. Home teams in bold. Did a Freaky Friday thing happen we were not aware of this season? Somehow, it appears the Big 12 and SEC have switched bodies. Outside of Baylor, which is putting up historic offensive numbers, no one in the Big 12 is lighting up scoreboards. 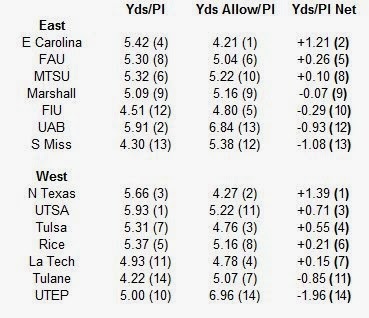 Collectively, Big 12 teams are averaging 5.38 yards per play in conference games. 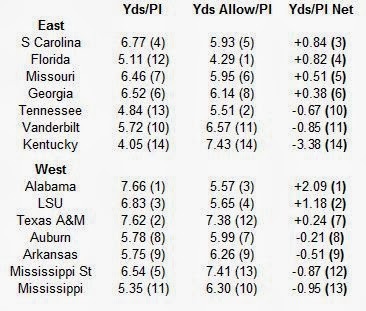 Meanwhile over in the SEC, teams are averaging a more robust 6.14 yards per play in conference games. TCU has the second best defense in the Big 12, and despite an 0-2 conference start and a narrow win over Kansas last week, the Horned Frogs still have realistic designs on a Big 12 title. Consider they have already played both Texas Tech and Oklahoma (on the road no less) and get to host Baylor over Thanksgiving weekend. If TCU can get their act together in Stillwater, they will still be in the running. TCU is 6-1 Against the Spread (ATS) as a road underdog since 2011, and stand a real shot at winning outright this weekend. I was high on Georgia Tech when the season began, but the bloom has slowly wilted off that rose. First came a home loss to a Virginia Tech team with an elite defense. Then came the no-show in Miami where the defense allowed the Hurricanes to march ruthlessly and efficiently up and down the field. Then came the trip west to Provo and a second consecutive pasting at the hands of BYU. Now the Yellow Jackets return home to take on a Syracuse team that won its first ever ACC game last week in Raleigh against NC State. Syracuse is a middle of the road ACC team, but catching more than a touchdown against another mediocre foe makes them a solid play here. One would think Utah is a shade over-valued after their home upset of Stanford over the weekend. However, with the Utes catching points they appear to be a solid play here. Utah has vastly improved their offense over the anemic units they had put on the field in their first two seasons in the Pac-12. Ten times in 2011 and 2012 the Utes scored 20 or fewer points. Thus far in 2013, they have failed to top 20 points just once. The Wildcats have proven themselves susceptible to big plays, allowing a combined 69 points in their first two conference games against Washington and Southern Cal. The Utes have played five good teams in the early going, beating a quality and full-strength Utah State team at home, losing tight home contests against Oregon State and UCLA, and pulling off upsets against BYU (on the road) and Stanford (at home). In addition, Arizona is just 2-4 ATS as a home favorite under Rich Rodriguez. I think this one will be close, and Utah has a real shot at winning outright. Ohio State has won 18 consecutive games under Urban Meyer, and with no ranked teams left on the schedule (at least until the Big 10 Championship Game), moving the streak to 24 is not out of the question. However, the Buckeyes have often been far from dominant. As double-digit favorites in The Horseshoe the Buckeyes are just 3-5 ATS under Meyer. Iowa has not been a double-digit road underdog since 2009 against...Ohio State. In that game, the Hawkeyes covered and lost by a field goal. The Hawkeyes probably won't be able to win this game, but they should make the Buckeyes uncomfortable well into the fourth quarter. Like Utah, the Bruins of UCLA appear to be underrated by the general public. Despite two very impressive road wins (and covers) against Utah and Nebraska, the Bruins find themselves as nearly a touchdown underdog against a Stanford team that appears to be overrated. Since Andrew Luck left town, Stanford is just 2-7 ATS as a home favorite. I look for that trend to continue as the Bruins have a great chance to beat Stanford for the first time since 2008. Very quietly, the Memphis Tigers have played solid football despite a 1-4 start. The defense has truly been a revelation, holding the last four opponents under 300 yards of total offense. Going back to last season, the Tigers have held seven of their last eight foes to sub-300 yardage totals. Under second year head coach Justin Fuente, the Tigers are 6-2 ATS at the Liberty Bowl. The Tigers will host SMU, a fellow American Athletic Conference member that has also endured a 1-4 start. The Mustangs have played solid defense as well, at least against teams not quarterbacked by Johnny Manziel. However, under June Jones, the Mustangs are just 2-7 ATS as a single digit road underdog. I think this will be a low-scoring affair, but Memphis should do enough to win by more than a field goal. Go ahead and jump on the Texas Tech bandwagon now. The Red Raiders are perhaps the most under-valued team in the nation, both by the polls, and the public at-large. The Red Raiders rank just 16th in the nation, but have been the second-most dominant Big 12 team in terms of yards per play outside of Baylor. The Red Raiders have also played solid defense, holding their last three opponents to just 275 yards per game. West Virginia did spring a huge upset in their last home game, beating Oklahoma State as a nearly three touchdown underdog, but against competent teams, the offense has been nonexistent this season. Texas Tech is 8-1-1 ATS as a road favorite since 2010 (meaning they were winning and covering in such games even during the relatively down Tommy Tuberville era). Look for the Red Raiders to win by at least a touchdown here. It appears as if the public has rushed to bury Georgia after their loss to Missouri. Keep in mind, Missouri with James Franklin is has one of the best resumes in the nation. The Georgia offense was still prolific against Missouri, even with the glut of injuries the team has faced. Laying just a touchdown on the road makes Georgia hard to pass up. Since opening the 2011 season 4-0, including a win at Notre Dame, Skip Holtz has not seen many bright days as a head coach. Against IA teams, his record is just 4-20 and 6-17-1 ATS in that span. Perhaps not surprisingly, he lost his job at South Florida, and perhaps surprisingly, he found employment at Louisiana Tech. North Texas has positioned itself as a player in the Conference USA race and should be able to win, even on the road, by at least a touchdown. Last week, the Ohio Bobcats were upset at home, as they lost to Central Michigan after muffing a late punt. Now they take their show on the road and are still double digit favorites. How is that possible? Because, simply put, Eastern Michigan is putrid. The Eagles have beaten just one team in 2013, the Howard Bison of IAA. In addition, the Eagles are just 2-7 ATS as a double digit home under dog under Ron English. Ohio should be able to move the ball at will against the Eagles and win rather easily. The past few seasons I have attempted to handicap the league races beginning in mid-October based on a rating system I stole from Eddie Epstein called SDPI. This season, I will still attempt to handicap the races, but instead of SDPI, I will use a more rudimentary metric, yards per play. 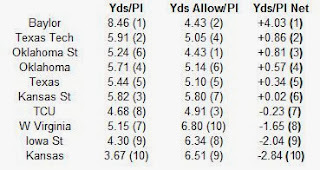 Yards per play is a good indicator of how efficient a team is at moving the ball and preventing others from doing the same, and can be a better measure of how strong a team is versus standard won/loss record or scoring margin. In this first post, we'll examine three leagues that have already completed significant portions of the conference play, the MAC, the Pac-12, and the SEC. Here are the MAC standings. The cream of the MAC has been very top-heavy in 2013. 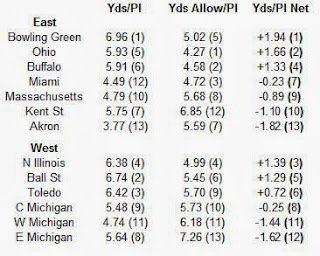 The top-six teams in terms of yards per play have gone 12-1 against their conference brethren with the sole loss coming this past weekend when Ohio fell at home to Central Michigan. MAC teams have won four games against BCS-conference opponents, posting an overall record of 4-23 in such situations. However, the top-six teams have gone a much more respectable 4-7, with the five of those losses coming to teams currently ranked fourth, eighth, twelfth, fourteenth, and twenty second. Akron--The Zips have now lost 19 consecutive conference games and have won just once in their past 27 league games. Will the streak end this season? I'm thinking Terry Bowden and Co. will celebrate on November 2nd against Kent State. Ball State--After their road win over Virginia, the Cardinals had to stage a comeback to beat Kent State at home. Realistically, they should be 9-1 when they travel to Dekalb to take on Northern Illinois for some mid-week MACtion on Wednesday November 13th. Bowling Green--The Falcons currently rate as the top team in the conference and are seeking their first conference title since 1992. They proved their mettle this past weekend in losing by a single point at Mississippi State. The games that should decide this race will take place on non-traditional football days, when the Falcons host Ohio on Tuesday November 5th and when they travel to Ralph Wilson Stadium to play Buffalo on the Friday after Thanksgiving. Buffalo--Since a rough opening stretch that included road trips to Ohio State and Baylor, the Bulls have won four in a row and are in good position for their first bowl appearance since 2008. Central Michigan--The win over Ohio was huge for their bowl hopes. Their next two games are against Northern Illinois and Ball State, but they close with three games (Western Michigan, Massachusetts, and Eastern Michigan) that are infinitely winnable. Will a 6-6 Central Michigan team get to a bowl? The odds would be against it, but they have put themselves in position to get back to the postseason and petition to be the worst bowl team for the second year in a row. Eastern Michigan--Not much to be said here. This team is bad and Ron English will probably be unemployed when the season is over, if not sooner. Kent State--Where has Dri Archer gone? One of the most electric players from last season (three kickoff return touchdowns and nine yards per rush) has touched the ball just 33 times in 2013. Massachusetts--The Minutemen earned just their second win as a IA program this past weekend against Miami of Ohio. Miami--The Redhawks fired their coach a few days ago, and despite the winless start, the defense has been solid. I think they are winless no more after facing Akron this week. Northern Illinois--The Huskies are probably not as good as they were last season, but they have beaten two Big 10 teams (Iowa and Purdue). Okay, maybe one and a half. Ohio--Despite the loss to Central Michigan, the Bobcats have all their goals intact. With games remaining against Bowling Green and Buffalo, they still control their own destiny in the MAC East race. 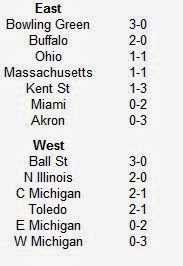 Toledo--The Rockets acquitted themselves reasonably well against Florida and Missouri in non-conference play. The Rockets definitely drew the short end of the stick in the scheduling department, in having to face both Bowling Green and Buffalo from the East. Western Michigan--As far as debuts go, things could have gone better for PJ Fleck. The Broncos have yet to win a game, but thankfully, Massachusetts and Eastern Michigan are still on the schedule. 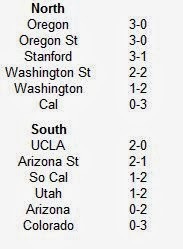 Here are the Pac-12 standings. Pac-12: Can anyone challenge Oregon? In the early going, the Ducks have been head and shoulders above their league brethren. In the Pac-12 South, will UCLA make it three for three in division titles? In non-conference play, Pac-12 teams have gone 6-4 against fellow BCS-conference opponents (and Notre Dame). Only one Pac-12 team has lost to a non-BCS conference team, and that was to a IAA opponent. Arizona--Early on, the offense has been the issue. Can the Wildcats rebound with four home games left on the schedule? Arizona State--When the Sun Devils win, they usually win big. Of their ten wins against IA teams under Todd Graham, seven have come by at least 20 points. Cal--Can you find a conference win on their schedule? At Colorado or home against Arizona seem the most likely candidates. Colorado--So much for that optimism after a 2-0 start. At least they should beat Charleston Southern this week. Oregon--The Duck Dynasty has not missed a beat without Chip Kelly. Not to be outdone, the defense also ranks first in the Pac-12. Oregon State--As if you needed further proof that the AP Poll is a crock. In the latest edition, Oregon State received 21 votes. Utah received 47. Oregon State won at Utah and is 5-1. Utah is 4-2. 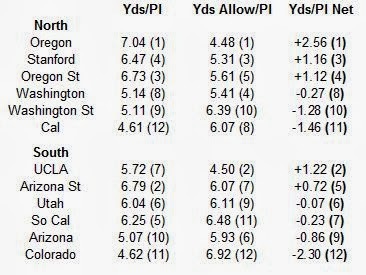 Southern Cal--Is the defense really that bad? Probably not, but there are a number of strong offenses remaining on the schedule itching to prove me wrong. Stanford--You had to figure the close game luck would run out sooner or later. The Cardinal had won six straight games decided by one score prior to the loss at Utah. Overall, they are 11-4 in such games under head coach David Shaw. UCLA--We'll know a lot more about the Bruins in the next two weeks when they travel to Stanford and then Oregon. UCLA has not beaten either team since 2008. Utah--The offense is much improved over last season when they averaged an anemic 5.03 yards per play. Washington--The Huskies proved they could hang with Stanford, and then proved how powerful Oregon is. Now can they rebound with those two games behind them and win more than five conference games for the first time since 2001? Washington State--When we look back on the 2013 season, perhaps the most bizarre final will be Washington State's 10-7 over Southern Cal in Los Angeles. How did these two defenses allow just a single offensive touchdown in that game? 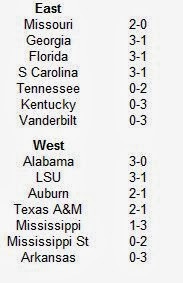 Here are the SEC standings. And here are the play by play ratings. The SEC East suddenly became intriguing over the weekend. South Carolina, Florida, Georgia, and Missouri are all in the mix. The big question is, will any of it matter when they (presumably) face Alabama in the SEC Championship Game? In non-conference play, the SEC has an 8-6 record thus far against other BCS-conference teams. The lone loss to a non-BCS conference foe came when Kentucky lost to Western Kentucky, coached by someone very familiar with the SEC. Alabama--Since the Aggies moved the ball with ease on them, the Crimson Tide have returned to their dominant selves on defense. Oh, and the offense has continued to be explosive. Arkansas--This might be a long season for the 'Hogs. There is not another guaranteed win on the schedule. Karma anyone? Auburn--Quietly the Tigers are 5-1. Despite mediocre numbers on both sides of the ball, they are just a single win away from bowl-eligibility. Florida--LSU proved the defense was not impenetrable, but the Gators can take solace in the fact that they will not face a more hostile environment the rest of the way than the one in Death Valley. Georgia--The defensive struggles were bound to catch up with them. Still, the 'Dawgs control their own destiny in the SEC East. Kentucky--Can the Wildcats play spoiler down the stretch and keep someone (maybe Vanderbilt or Tennessee) from attaining bowl eligibility? LSU--The Tigers appear to be the biggest threat to Alabama in the SEC West. On November 9th, they travel to Tuscaloosa. Mississippi--The Rebels should get back to a bowl game, but any talk of them being a player in the conference race were premature. Mississippi State--The Bulldogs must win three of the of their final six to qualify for a fourth consecutive bowl. That could be a tall order as three of those teams are currently ranked in the top eleven of the AP Poll. Missouri--The loss of James Franklin put a serious damper on their season. That is a real shame because the Tigers have three of the best road wins (Indiana, Vanderbilt, and Georgia) of anyone in the nation. South Carolina--This is probably the best offense Steve Spurrier has had in his tenure in Columbia. The season ending game against Clemson could be for an at-large BCS bowl bid (for both teams). Tennessee--One season after featuring a powerful offense and a sieve of a defense, the Vols have reversed course. With four ranked teams left on the schedule, a bowl game is not assured. Texas A&M--The Aggies have big time issues on defense that will probably cost them before all is said and done. Vanderbilt--Can the Commodores get to a bowl for a school-record third straight season? They will probably have to spring an upset along the way to do so. Well, that was rough. We had a bad week, particularly calling favorites, only nailing one correctly. The 3-7 mark was pretty disastrous, but there are still nine weeks left to make a positive change (or dig the hole deeper). The yearly mark now stands at 26-33-1. Time to get back on track. Home teams in bold. With the American Athletic Conference in relative shambles, these next two weeks will represent the toughest test for Louisville in authoring an unbeaten season. That's not to say they couldn't stumble elsewhere (they did lose at home to Connecticut last season after all), but the next two games against Rutgers and Central Florida represent their toughest tests on paper. Louisville has not been slowed down all season, averaging over seven yards per play in each of their first five games. However, though not elite, Rutgers will be the stoutest defense they have faced all season. The Scarlet Knights have seen their offense improve under quarterback Gary Nova, who has cut down on his mistakes and hit more big plays in the passing game. Rutgers probably lacks the defensive studs to hold Louisville in check to pull off the upset, but this one should be marginally competitive. Despite a glut of injuries, Georgia pulled out a crucial SEC road win last week to bring their conference record to a perfect 3-0. With home wins over South Carolina and LSU, the Dawgs are clearly a legit contender in the SEC. However, lost in the afterglow of their 3-0 league start is the fact that their defense has been a bit leaky. They have allowed at least 30 points to every BCS-conference team they have faced. Despite having Aaron Murray at quarterback, that is bound to catch up to them before all is said and done. Enter Missouri, a team that is quietly 5-0 with two under the radar road wins (Indiana and Vanderbilt) that were never really in doubt, and a quality home win against a solid MAC school (Toledo). Missouri may not be able to beat Georgia between the hedges (the Dawgs have won their past 15 at home), but I think they can make this one a little too close for comfort. Since becoming an elite defensive team in 2012, the Gators have been money in the bank when catching points either at home or on the road. The Gators are 3-0 Against the Spread (ATS) as a road underdog in that span and 4-0 ATS overall as a dog. In the role of a home favorite against conference foes, Les Miles and LSU are just 6-9-1 ATS since 2008. If we remove the fluky 2011 season when LSU was a covering machine, the numbers drop to 3-8-1. This one has all the makings of a close Florida win, or an LSU escape. Last week, Utah State saw their nine-game home winning streak snapped in grisly fashion at the hands of their in-state rival BYU. The Aggies rolled up nearly 400 yards against the stout BYU defense, but were only able to muster 14 points on the scoreboard. Now the Aggies must regroup as they host Boise State in a key Mountain West conference clash. The Broncos have not won a road game this season, having lost to both Washington and Fresno State earlier in the 2013 campaign. A loss here would be a death knell for Boise's conference title hopes as they would be two games behind the Aggies in the Mountain Division, with Utah State holding the tiebreaker. These are not Kellen Moore's Boise State Broncos. In six games last season against bowl teams, Boise was just 2-4 ATS, and just 1-4 ATS in the role of a favorite. Against the only two likely bowl teams they have faced this season, Boise is 1-1 ATS, but has lost both games. This should be a tight affair that is decided in the final minutes, and seven points is simply too much to give. Oregon State has been one of the best road underdog plays over the past few seasons. Since 2009, they are 13-5 ATS as a road underdog with eight outright wins in the 18 games. The Beavers take their show on the road to Pullman this week to face off against a Washington State team that has won four games for only the second time since 2007. After a rough first year on the Palouse, Mike Leach has made the Cougars competitive again. In fact, for just the fourth time since 2008, the Cougars are favored in a conference game. Last week against Cal marked the first time they covered (or won as a conference favorite) since beating Jim Harbaugh's first Stanford team in 2007. The Cougars are a shade overrated, having beaten an inconsistent Southern Cal team, a young (and bad) Cal team, and no one else of note. Oregon State already owns a pair of road wins, versus Utah and San Diego State, and has an excusable loss to a solid IAA team (Eastern Washington). Mike Riley usually comes through in this role, and I expect that trend to continue here. Since arriving at Norman in 1999, Bob Stoops and the Oklahoma Sooners have beaten Mack Brown and the Texas Longhorns in nine of the fourteen meetings, including a current three-game winning streak. Four of the nine wins by Stoops have come in blowout fashion, including the last two that have come by a combined margin of 118-38. This has the feel of one of those lopsided games. True, Oklahoma is 0-2 ATS as a large home favorite in their first two Big 12 games, but Texas is probably not as good as West Virginia or TCU. I think the Sooners roll here and potentially send Mack Brown to the unemployment line. As far as misleading final scores go, they don't come any better than the Mean Green's trip to New Orleans last week. North Texas outgained the Green Wave by more than 130 yards and averaged two more yards per play. However, Tulane returned an interception and a blocked field goal for a touchdown, yet still needed a late field goal to win. Now North Texas returns home where they are 9-2 under head coach Dan McCarney and 4-0 ATS as a home favorite. The Mean Green will turn their attention to Middle Tennessee State, a team they have played for the past twelve seasons as members of the Sun Belt conference. Middle Tennessee State is just 4-7 ATS as a road underdog since 2011, and has already lost twice in grisly fashion on the road (to North Carolina and BYU). North Texas should win by at least a touchdown here. Is Baylor for real? Granted, they probably will not average 70 points for the entire season, but what they have done in their first four games is downright impressive. Dating back to their final four games of last season, the Bears have averaged 59.5 points per game, never scoring fewer than 41 in any game. Their average margin of victory has been over 35 points per game. Last season, their final four opponents all qualified for bowls, including a then unbeaten Kansas State team. Of course, things could go horribly awry in Manhattan, as they did two years ago when the Wildcats upset a Robert Griffin led Baylor team that would win ten games and set the standard for modern Baylor football. I think the Bears find the going a little tougher than normal, and maybe even play their starters deep into the second half, but a win by three touchdowns seems about right. Penn State returns to Happy Valley fresh off a 20-point drubbing at the hands of...Indiana?! There's a sentence I didn't think I would ever type. The Hoosiers held the Nittany Lions to their second-lowest yardage output of the season and scored the most points they ever have against Penn State. When Penn State has played a team with a competent offense (Central Florida and Indiana), they have not been able to stop them, allowing the Knights and Hoosiers to accumulate nearly 1000 yards on over 6.8 yards per play. As long as Michigan quarterback Devin Gardner avoids too many turnovers (its a given he will thrown an interception as he has one in nine of his last ten games), the Wolverines should be able to cover this small number. This game screams let-down for Northwestern. One week after nearly upsetting the Buckeyes as a touchdown home underdog (before a ridiculous backdoor cover made Ohio State backers very happy), the Wildcats now head to Madison to take on a Wisconsin team that has been money ATS at home. I'm surprised the line is this high, but Wisconsin has gone 12-4 ATS as a home favorite against Big 10 teams since 2009 and is 9-1 ATS as a double-digit home favorite against Big 10 foes. I think the Wildcats have a huge hangover and the Badgers roll. Despite a great start in the early games, we couldn't manage a second consecutive winning week. Still, 5-5 beats how we were handicapping early in the year. The yearly mark now stands at 23-26-1. Time to start October with a strong week. Home teams in bold. With the turmoil at Southern Cal, this game looms large in the Pac-12 South race. Thanks to not having played a conference game yet, UCLA is the only team in the South without a blemish on their league mark. The North as a whole has gone 5-0 against the South, so while Utah, Arizona, and Arizona State all have a conference defeat, they are still very much in the running with no division losses. Utah has been vastly improved on offense this season, averaging over six and a half yards per play in their three games against IA teams. The Utes averaged just 4.8 yards per play in such games last season. UCLA is also humming on offense, averaging nearly 53 points per game through their first three contests. 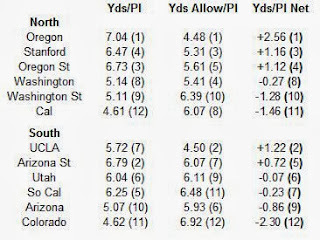 However, keep in mind those teams rank 110th (Nebraska), 118th (Nevada), and 123rd (New Mexico State) in terms of yards per play allowed on defense. Utah will represent their most significant challenge thus far in 2013 and should be one of the more entertaining Thursday night affairs. To me, this Iowa team seems to have a great deal in common with some of the best of the Kirk Ferentz era. For starters, there is the early season non-conference loss which has happened quite often to some pretty good Iowa teams. The Hawkeyes also appear to have their running game back where they want it, and a quarterback who can make defenses pay. Couple that with a division that is imminently winnable, and despite playing just one conference game, you could talk yourself into the Hawkeyes as a veritable Rose Bowl participant. First things first though, the Hawkeyes need to take care of business in Iowa City against a Michigan State team with big time issues on offense. The Spartans have not scored more than two offensive touchdowns against a IA opponent since early November of last season, a span of six games. While the Spartans have one of the best defenses in IA football, Iowa is no slouch on that side of the ball either. I expect this game to be very low-scoring, but I can't fathom how Michigan State is favored on the road against a team as solid as Iowa. Both Big 10 squads enter the game with identical 3-1 records, but the mood around each program could not be more different. For the fourth time in six seasons under Bo Pelini, Nebraska has a blemish on its resume before conference play begins. The Huskers dropped a home game to UCLA three weeks ago as they blew a 21-3 lead. Meanwhile, after winning just a pair of games last season, Illinois has looked good in the early going, with a blowout win over Cincinnati and a competitive loss to a pretty good Washington team dotting the ledger. By all accounts, this should be a shootout in Lincoln. Both these teams are averaging and allowing over six yards per play. Nebraska is just 4-6 Against the Spread (ATS) since 2011 as a double-digit home favorite, so they are far from a sure thing, even playing in front of the Big Red faithful. I've mentioned Pete Lembo before in this space, and he continues to do great things in Muncie, Indiana. After winning nine games last season, Lembo has the Cardinals at 4-1 early in 2013. After traveling to Charlottesville, the Cardinals return to MAC action for their final six, and with two wins banked, they look to be the top contender to Northern Illinois in the MAC West. How do the Cardinals stack up against the Cavaliers? Well, these teams could not be more different. 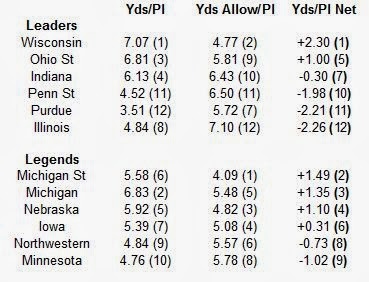 Ball State has averaged at least six yards per play in each of their games against IA foes. Meanwhile, Virginia has averaged under three and a half yards per play in their three games against IA foes. The Cavs have been stout defensively, holding each team they have played save Oregon to under four yards per play and no more than 16 points per game. Virginia has enough size and speed on defense to keep the prolific Ball State offense in check, but unless they force a plethora of turnovers, the offense won't be able to lap the Cardinals. Ball State has a history of beating BCS conference teams under Lembo, going 3-3 straight up and 4-2 ATS in such games. And wouldn't you know it, Virginia has two home losses to non-BCS conference teams. The Cavs lost to Southern Miss in 2011 and Louisiana Tech last season. Altogether, the Cavs are just 1-3 ATS against non-BCS conference teams. Look for Ball State to pull the outright upset here. After a disappointing debut in the SEC, Missouri appears to be competent this season. While the Tigers don't own a marquee win in their 4-0 non-conference start, they did win comfortably on the road against a solid Indiana team and also own a pair of home wins over mid-majors that will likely be in the postseason (Arkansas State and Toledo). Quarterback James Franklin has already thrown for nine touchdowns, after throwing for just ten in an injury plagued 2012 campaign. The Tigers seek to open SEC play with a win as they travel to Nashville. The Commodores have romped over three over-matched opponents (Austin Peay, Massachusetts, and UAB) and lost relatively close games to Ole Miss and South Carolina. This game starts a rough patch for the Commodores as they have a bye before facing Georgia, Texas A&M, and Florida in the ensuing four weeks. Despite their struggles last season, the Tigers were actually 3-2 ATS as a road underdog and are 6-3 in such a role since 2011. Look for Missouri to continue their winning ways before traveling to Georgia next week. 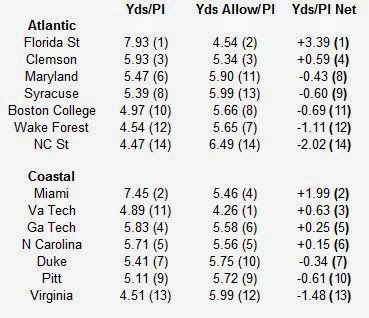 East Carolina has been featured twice in this space, and I have been wrong on them both times. May as well make it three for three right? Last week, the Pirates strolled into Chapel Hill and put 55 on the board against the Tar Heels. For comparison's sake, Middle Tennessee lost in the same venue a few weeks ago by 20 points. East Carolina has proven their mettle against a pair of ACC teams, including one team that may have the best defense in the nation (Virginia Tech). Look for the Pirates to win by at least two scores here. Fresh off a scare at Central Florida, the Gamecocks return to the friendly confines of Williams Brice, a place where they are nigh-unbeatable as of late. Since 2010, the year they first became a factor in the SEC East, the Gamecocks are 13-2 at home against teams from BCS conferences, and are 9-5 ATS as a double-digit home favorite. Last time here, the Gamecocks crushed Kentucky 54-3. Kentucky has played one good game all season, against a pitiful Miami of Ohio outfit and are 2-7 the past two seasons as a double-digit road underdog. Look for the Gamecocks to roll here. There has never been a better time to buy yourself some Oklahoma State stock. Going halfway across the country to face a team more dangerous than the nation gave it credit for, Oklahoma State stumbled. Now they return home where they are 50-16 under head coach Mike Gundy. Since the beginning of the 2010 season, they have also been solid plays as a home favorite, posting a 7-3 ATS mark as a double-digit home favorite and a 12-4-1 ATS mark overall as home chalk. Kansas State is a dangerous team, but not nearly the national player they were last season. Look for the Cowboys to get healthy and return to their winning ways. I know the Gators are just 2-6 ATS in their last six games as home favorites, but I think the public has turned against Florida and artificially deflated this line. Consider that each of Florida's wins this season have come by at least 14 points and their offense and defense are actually playing better than they were last season. In addition, Arkansas is probably getting a little too much love for hanging with Johnny Manziel and Texas A&M last week. The Razorbacks hung 33 on the Aggies, but should find the going much tougher against one of the best defenses in the nation. Look for Florida to win this one by about two touchdowns. These two teams have met for the past eight seasons as Conference USA opponents, and this represents their first game as American Athletic Conferences foes. Central Florida gave the Gamecocks from the SEC all they could handle last week before falling 28-25. Now they travel to Memphis, a venue where they have beaten the Tigers in their last four trips. In their first two forays to Memphis, they won by just two and seven points respectively, but in their last two appearances, they have won by a combined 38 points, including an 18-point win last season. The Knights (and perhaps the other Knights up north) are the only real threats to Louisville in the conference. Look for them to remain focused despite their setback last week, as a BCS bid is still on the table.